From CNBC, I gather that Goldman Sachs received $10 billion in TARP funds, and paid out $10 billion in bonuses. Of course, the typical CNBC crew resorts to this news with shouts of ‘class warfare!,’ but I think there’s an interesting problem here. I was under the impression that the TARP was to stabilize institutions whose failures were otherwise unavoidable and whose downfall would lead to massive jolts to the global economy. Instead, it appears that Goldman Sachs faced a choice between going bust and perhaps losing those employees who could other jobs in this bad economy, and of course would face higher rates of employees quitting in the years ahead. How “needed” are these TARP funds if the choice is not between bankruptcy and TARP, but between reduced marginal ability to retain staff and TARP? When you’ve maneuvered yourself into a position where the Nazis are leading the opposition, you know you’ve done a great job wrecking your countries political system. Congratulations, Prime Minister Putin. Capitalising on growing popular discontent, the organisers are planning to keep the pressure on the Kremlin, presenting the strongest challenge yet to the once untouchable Putin government. The moves come after a weekend of protests in Moscow and Vladivostok that saw thousands of Russians take to the streets to call for the dismissal of the Russian prime minister and President Dmitry Medvedev. The groups believe that the country’s worsening economic situation, as well as the easing of freezing winter temperatures, will bring people to the streets in ever greater numbers in the weeks to come. The Kremlin has taken note of the protests, organising a competing demonstration of the pro-Kremlin United Russia party on Saturday. Coverage on state-run television gave overwhelming attention to those protests, making no note of a violent opposition rally held the same day. Protestors from Other Russia, an umbrella group that joins Mr Kasparov’s United Civil Front with the banned National Bolshevik party, were left bloody and beaten after holding an unsanctioned rally in the capital on Saturday afternoon. More specifically, the National Bolsehviks / Nazis are part of the Third Position constellation of movements inspired by Otto “Let’s put the Socialism back into National-Socialism‘ Strasser. 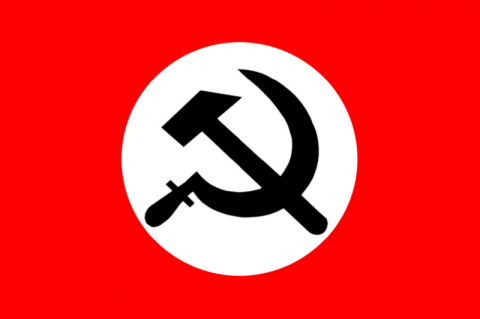 Just as the broken systems of Egypt and Saudi Arabia generated Egyptian Islamic Jihad and al Qaeda, because no legitimate opposition was possible, the broken system of Russia generated the National Bolshevik Party. Of course, the difference in the analogy is that the NBP hasn’t engaged in terrorism (yet) and, in opposing the cronyism of the Putin regime, is actually pushing for more international trade. 1990 saw two film adaptations of the life of mobster Henry Hill: Goodfellas (directed by Martin Scorsese, starring Ray Liota, Robert DeNiro, and Joe Pesci) and My Blue Heaven (directed by Herbert Ross, starring Steve Martin, Rock Moranis, and Joan Cusack). Watching both back-to-back is a surreal experience. Most of the events of My Blue Heaven take place between 2 hours 12 minutes and 2 hours 14 minutes into Goodfellas, making it conceivably possible that a “Henry Hill Saga” could try to create one movie with a running time of nearly four hours combining both films, but told chronologically. Further, Henry changes appearance(from the Leonardo DeCaprio lookalike of Ray Liota to Steve Martin), family status (his two kids mysteriously disappear), name (from Henry to Vincent), and ethnicity (the discrimination on the part of the Sicilian mafia against Irish such as Henry is a minor plot point in Goodfellas — in My Blue Heaven, Henry is over-the-top Sicilian. Neither movie was particularly good, but then neither was particularly bad, either. 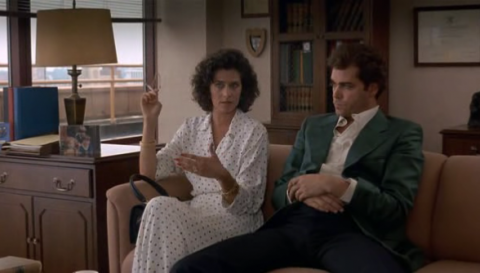 Goodfellas suffers from the same problem as The Ruins — a movie about unlikeable characters has just too few characters to like. My Blue Heaven has the same “you’re supposed to find if funny” vibe that Steve Marin’s L.A. Story also had, but without the blending of 80s and 90s pop culture.